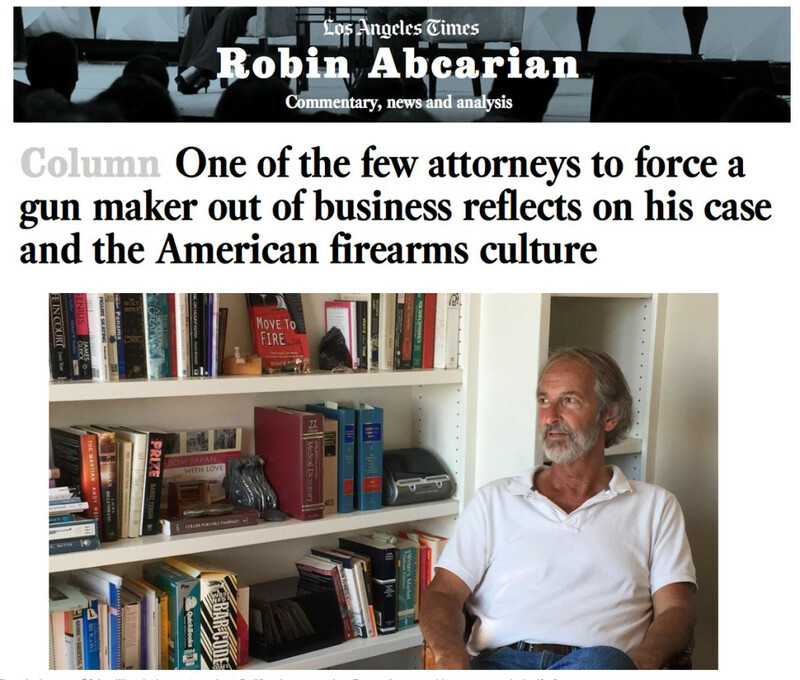 Journalist Robin Abcarian did a nice profile piece on attorney Richard Ruggieri. Move To Fire is mentioned in article and in an accompanying photo you can see the book on a shelf behind Ruggieri. check it out here. This entry was posted in America, books, facts, journalism, society and tagged Current Events, gun violence, guns, investigative journalism, journalism, Law, Los Angeles Times, nonfiction books, safety, Society on September 9, 2016 by Mike. The pilot set a course that paralleled highway 101 and, at some point, overtook Sue and Clint in their car below. Both vehicles were moving the family away from their previous, normal lives and toward an unknown future. Brandon was flying away from a normal childhood, leaving behind games of hide and seek in the woods, adventures on his bike and baseball games in the summer. Whether he lived or died, he would never take another step, never wave hello or goodbye, and never hug again. Ripples from the accident moved through the entire community, and the effects would touch, alter, and impact hundreds of lives. From its small but explosive beginning, the accident’s economic and financial impact on people, schools, the health care and legal systems wouldn’t be fully realized for years, but the effect on the local emergency services and medical system was already substantial, quickly hitting the tens of thousands of dollars in hard costs for the sheriff, paramedics and CDF responses, the ambulance and emergency room treatment, physicians and staff. The ripple was now moving south at an altitude of two-thousand feet. Every passing minute the REACH chopper was in the air was a minute of calculated risk, and this flight would add $5,000 to the growing costs of Brandon’s accident. As in so many other aspects of their lives, the family was no different than many blue collar and low income working families, in that they had no health insurance to speak of, nothing that would address anything as catastrophic as Brandon’s sudden medical and health care needs. At a point in the very near future, they would be forced to deal with the paperwork, documents and liens associated with all of this, but right now their toll was psychological, emotional devastation. The drive to Santa Rosa Memorial hospital took almost ninety minutes. When they arrived, Sue and Clint were told the flight had been redirected to Oakland’s Children’s Hospital, another ninety-minute drive to the southeast. They had left Willits an hour and a half ago, not knowing the condition of their boy, but because the helicopter had not stopped in Santa Rosa, no one there had any information about Brandon. Clint and Sue wouldn’t know Brandon’s condition for at least another thirty minutes. This entry was posted in America, books, family, guns, healthcare costs, society, trauma and tagged emergency medicine, emergency response, health care costs, nonfiction books, safety, Society, trauma on July 21, 2016 by Mike. The instructions that couldn’t be followed. These are the instructions that Bryco tried to hide, better known as the instructions that couldn’t be followed because the gunmaker changed the safety design to hide the gun’s feed jam flaw. This entry was posted in courtroom evidence, courtrooms, facts, guns, law, regulation and tagged engineering, guns, Law, nonfiction books, regulation, safety on July 20, 2016 by Mike. Twenty-four hours before the shooting, and six-hundred miles south, in Anaheim, California, a fax was transmitted from Brown & Wilcox, a commercial insurance underwriter, to an agent at an insurance brokerage, regarding Bryco Arms, the manufacturer of the Bryco Model 38. Bryco had just come off of a good year, with $7,000,000 in sales from 1993-1994, and $14,000,000 sales projections for the next year. The small, privately owned company held the top spot of the small handgun industry. Sales for the Bryco Model 38 were more than $2,500,000 dollars. But the company had been negotiating the cost of liability insurance. The current policy had officially lapsed on April 1st. The new policy would be almost $250,000, an almost $40,000 increase. Bryco Arms and other small handgun manufacturers were seeing increasing premiums across the board. Market forces, changes in gun laws, especially in California, growing anti-gun sentiment, bad press and a slow but steady rise in litigation against gun makers had insurance companies re-evaluating their clients. The makers of small guns were serious liability risks, and the insurance companies that continued to insure handgun manufacturers had increased premiums and narrowed coverage. As Bryco Arms’ policy neared expiration and the company shopped around for a new policy, three major insurance companies declined to quote coverage for the company. And so, two days before seven-year old Brandon Maxfield had been wheeled into his small town’s emergency room, closer to death than life, unable to breathe on his own, his spine shattered just below the base of his skull, the manufacturer of the Bryco Model 38 had chosen to ‘go bare’ — Bryco Arms was now without insurance to compensate anyone injured by a defective Bryco handgun. This entry was posted in books, current events, facts, guns, regulation, society and tagged books, guns, Law, nonfiction books, regulation, safety on July 20, 2016 by Mike. He knew he wasn’t supposed to touch it, but he and Jerry were in charge, and the crazy guy above them had a gun. There was a lot that could happen before the sheriffs could get back here. How could you protect yourself from someone with a gun, unless you had a gun too? Next to the gun was a dark-gray magazine. The bottom of that magazine was bright, brushed aluminum. This entry was posted in books, facts, family, guns, writing and tagged family, guns, nonfiction books, safety on July 20, 2016 by Mike. This is the old trailer for a proposed documentary about the Move To Fire story; at the time it was called Showdown. Great overview for the book, frankly. This entry was posted in America, books, courtrooms, current events, documentary, guns, regulation, society and tagged Current Events, gun violence, Media, nonfiction books, regulation, safety on July 20, 2016 by Mike. “…[Move To Fire] corrects misconceptions about what happened to a little boy… why it happened, and recounts how the unwavering work of one man resulted in a measure of justice for a family, and a society, unjustly wounded by the status quo. But underlying it all is something so crucially relevant yet widely unknown that without it there would be no Move To Fire story. …consumer products are regulated by the Consumer Product Safety Commission… to protect the public against unreasonable risks of injuries and deaths associated with consumer products. …there have been and are defective guns that can fire without the trigger being touched, but they cannot be recalled or taken off the market except by the manufacturer… And no government entity can force a gun manufacturer to recall or remove all those models. So, the worst extension of all this is that an unethical gun manufacturer could choose to create and sell a gun it knew to be defective, and, still, no entity could stop that from happening. This entry was posted in America, books, facts, guns, regulation and tagged Current Events, guns, Media, regulation, safety, Society on February 6, 2016 by Mike.